We have extended the linear fluid theory of electrojet plasma waves to the region where ion magnetization effects are important. Our general dispersion relation includes the effect of cross-field and field-aligned drifts, ion inertia, electron density gradients, and recombination. In the absence of density gradients and recombinational damping, the oscillation frequency at marginal instability is changed by the ion magnetization effects from the ion acoustic frequency, ω = kCs, to the modified ion cyclotron frequency ω² = Ωi² + k²Cs². These upper E region waves can be driven by field-aligned and/or cross-field drifts and have the smallest threshold drift velocities at heights where electron-ion and/or anomalous electron collision frequencies are important. In the upper E region the most unstable wavelengths correspond to k⊥Ri ∼ 1, where Ri is the ion Larmor radius. Electron density gradients can increase or decrease considerably the threshold drift velocity for large-scale (a few tens of meters and larger) waves. Recombinational damping increases the threshold drift velocity for marginal instability of two-stream ion cyclotron waves and imposes a threshold drift velocity for the excitation of large-scale gradient drift waves propagating nearly perpendicular to the magnetic field. The effect of recombination is surprisingly important, even for wavelengths as short as 10–20 m, for altitudes at which νi ∼ Ωi. At these altitudes and above, the effect of even a very small k∥ becomes increasingly important. 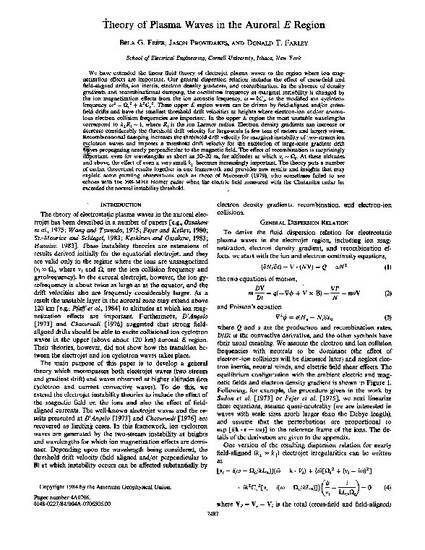 The theory puts a number of earlier theoretical results together in one framework and provides new results and insights that may explain some puzzling observations such as those of Moorcroft (1979), who sometimes failed to see echoes with the 398-MHz Homer radar when the electric field measured with the Chatanika radar far exceeded the normal instability threshold. Fejer, B. G., J. Providakes, and D. T. Farley, Theory of plasma waves in the auroral E-region, J. Geophys. Res., 89, 7487, 1984.